This first mortise lock installation is on a pair of solid carved doors on a new house for a client of Bills Lock, Safe & Security. This beautiful new home is located in Edison New Jersey. I had to be creative with the location of the lock within the carved door panel. Fortunately there are circular areas within the door design that made for a minimally intrusive installation for the lock and handle. The oil rubbed bronze Baldwin mortise locket was selected in part because the design is similar to the carved door panel. By selecting an appropriate lock design and then making a difficult custom installation, the beauty of the carved panel door is not diminished in any way by the functional mortise lock and handle. 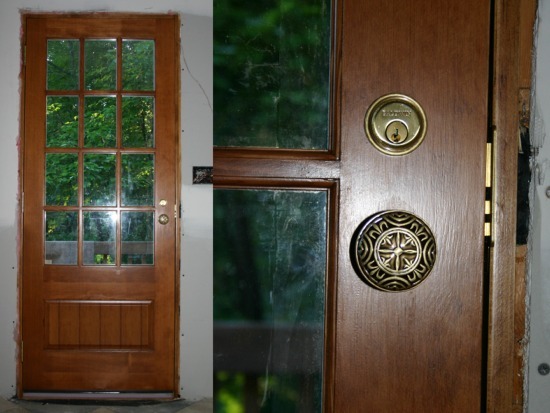 The next lock installation was on my own kitchen door during a recent home remodeling project. I've seen this Baldwin knob design in the catalog for years and despite installing hundreds of mortise locksets, no client had ever selected this style, I love it. In addition to installing the mortise lock, I finished the door interior to match the cabinets and painted the outside to match the house. You don't want to know how many hours I have in the finishing of this door! Mortise Lock is a lock that requires a mortise or hole cut into which the lock is fitted. Mortise locks do have advantages over more common cylindrical locks. Mortise locks are often sturdier locks that offer more protection from an unauthorized entry attempt. 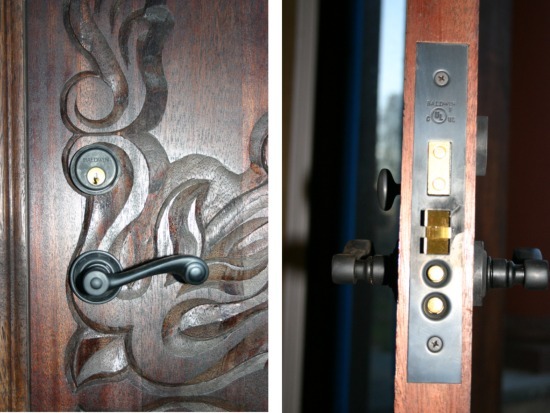 Also many people consider Mortise locks to be more attractive in appearance. Any door requiring the mortise cut be made before lock installation should be left to a trained locksmith or security professional.